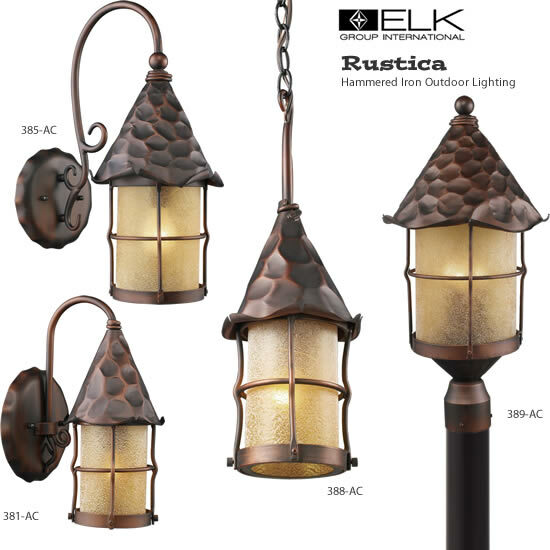 Width 7.5" x Height 14"
Width 10" x Height 19"
Width 6.5" x Height 18"
Width 12" x Height 26"
Bring storybook flair to an old english, cottage or spanish revival-style home with the rustica collection. 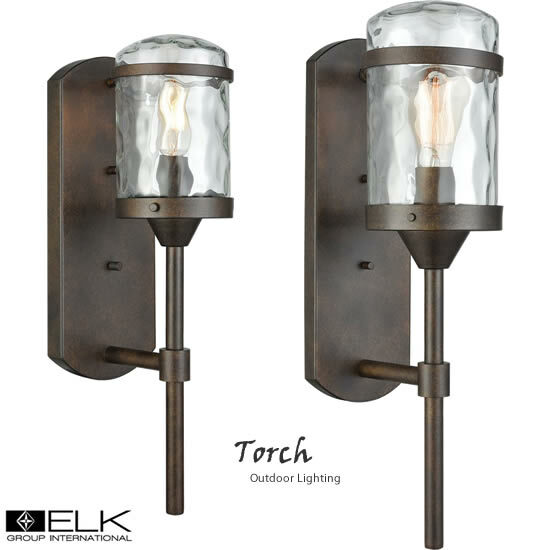 Hand-hammered iron and scavo seedy-glass cylinders characterize this series. 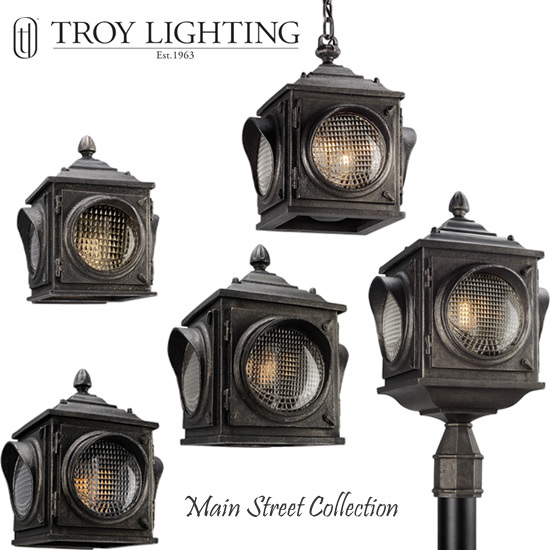 Height	9.75" x Width	4.88"
Height 10" x Width	4.88"
Height	8.75" x Width	4.25"
The Main Street Collection draws inspiration from early traffic lights and the lights to signal trains. 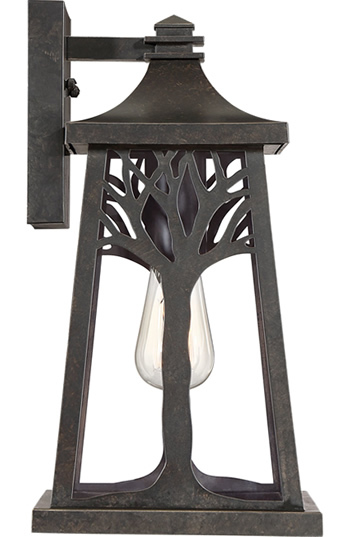 Three sizes of wall lanterns, a hanging pendant and a post light are all finished in Aged Pewter. 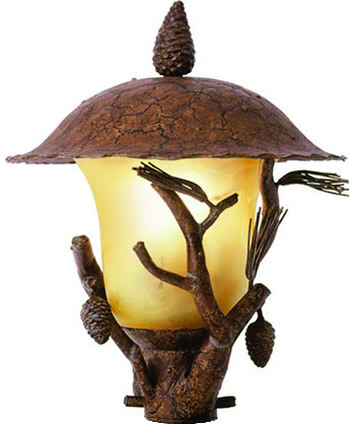 The heavy pressed glass diffuses light like the lens in a traffic signal. 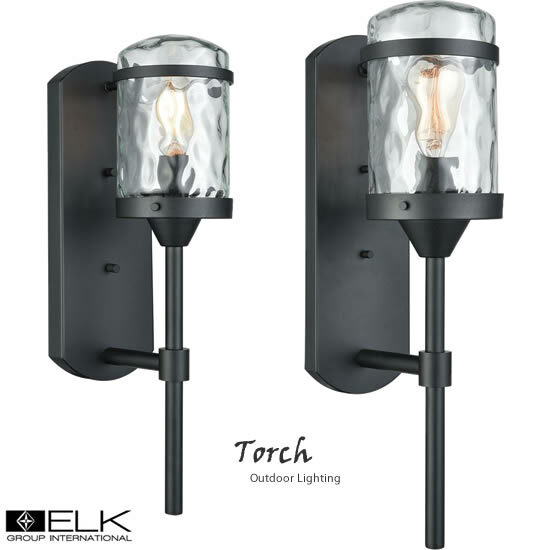 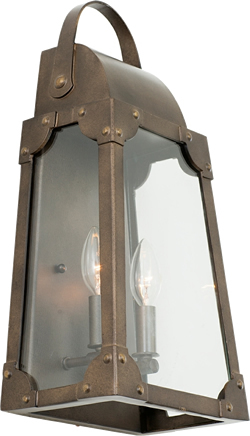 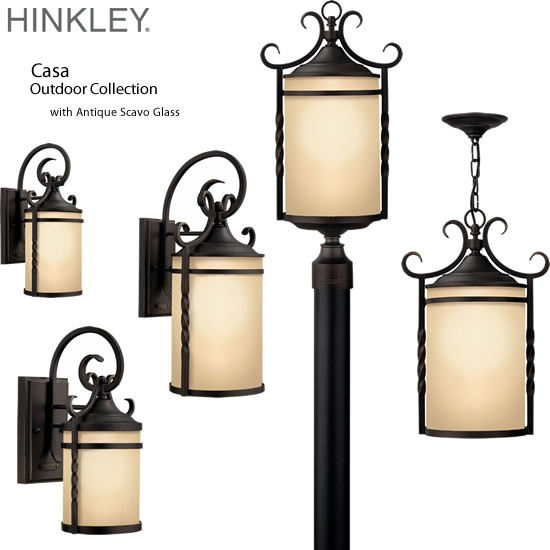 Dimensions: Height 8.75" x Width 6"
Backplate Depth: 2.25" x Width: 6"
Dimensions: Height 12.5" x Width 12"
Backplate: Depth 0.9" x Width 8"
Providing a timeless industrial aesthetic, the large Budapest outdoor sconce is extremely versatile, working not only for outdoor spaces, but interior spaces as well. 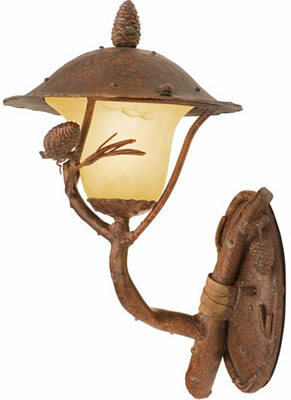 The Budapest Series also offers a small version of this beautiful fixture. 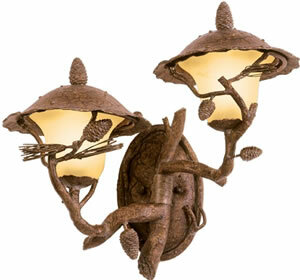 Nature was the first source of design inspiration and remains one of the best, as evidenced by the Wildwood collection. 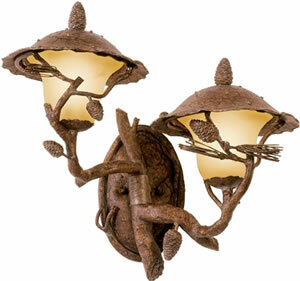 A stylized tree motif is backlit through clear glass to showcase the intricate details of this Arts & Crafts design. 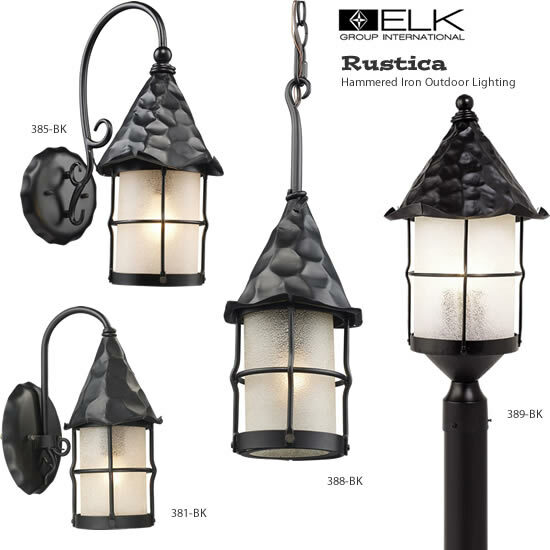 The collection is constructed of a weather-resistant resin that withstands extreme climates and carries an impressive 5-year warranty. 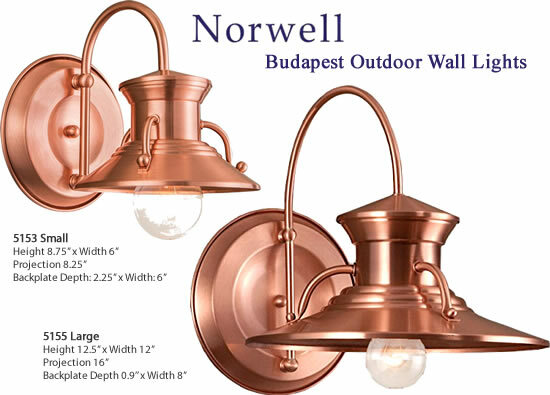 The warm imperial bronze finish is best showcased by vintage filament bulbs. 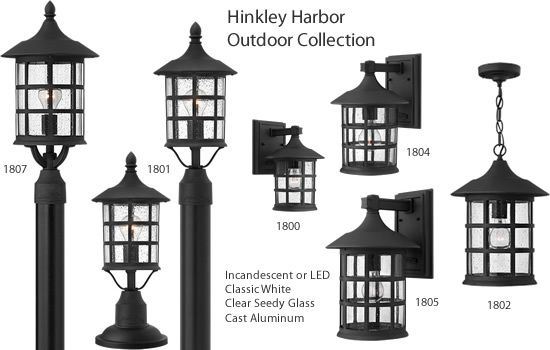 Height 17-1/16" x Width 8-1/8"
Height from center of outlet box 9-5/8"
Height 14-5/8" x Width 8-1/8"
Bigger than you expect at a great price! 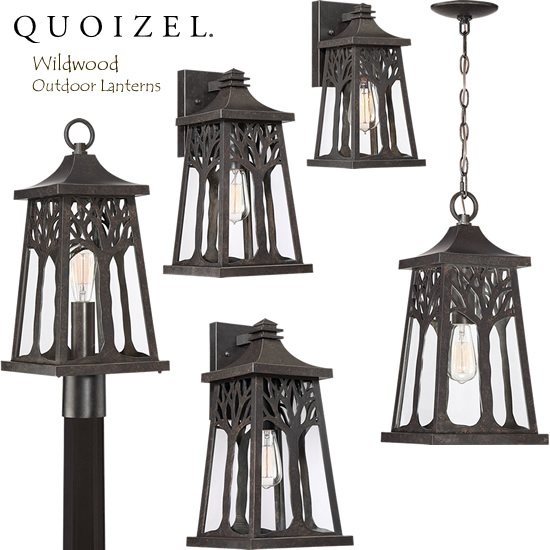 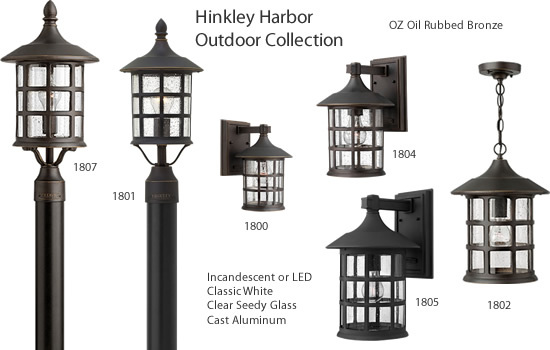 The Ferry outdoor wall lights fit industrial, coastal and rustic outdoor themes. 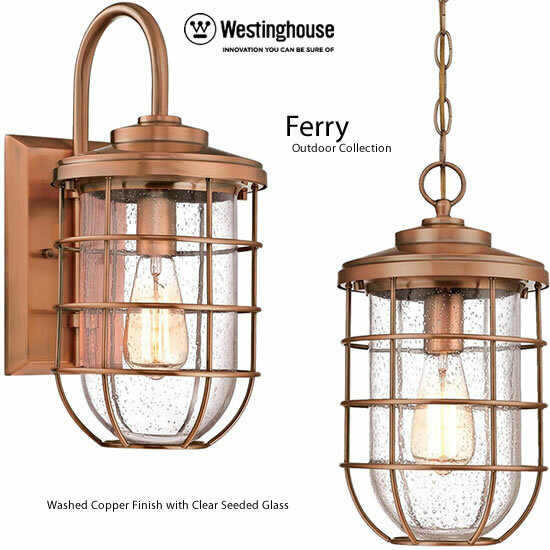 The Washed Copper or Brushed Nickel finish and cage design are sure to add rustic curb appeal to any exterior setting. 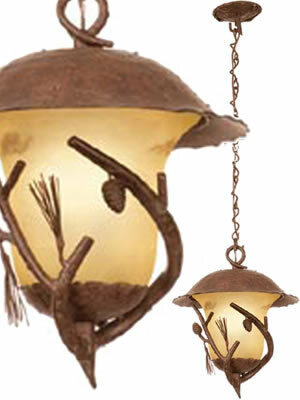 Clear Seeded Glass adds a textural element and allows a view of the bulb. 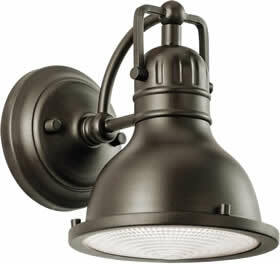 We recommend a Westinghouse filament LED or Timeless light bulb to add a retro touch to this fixture's unique style. 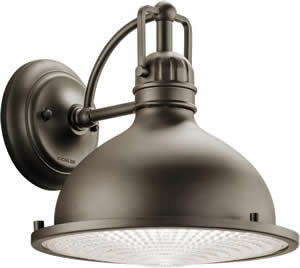 Frosted Glass obscures the bulb and is ideal for PL fluorescents. 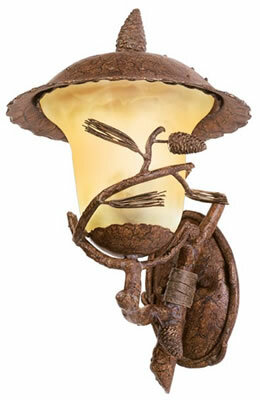 Dimensions: 20.25" Width x 17.5" H x 11.5" Ext. 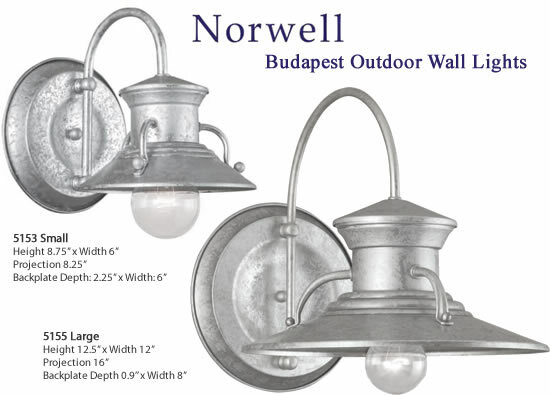 Dimensions: 10.25" Width x 17.25" H x 11" ext. 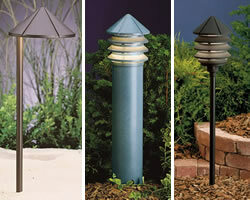 Dimensions: 14" W (each side) x 23" H x 14.5" Ext. 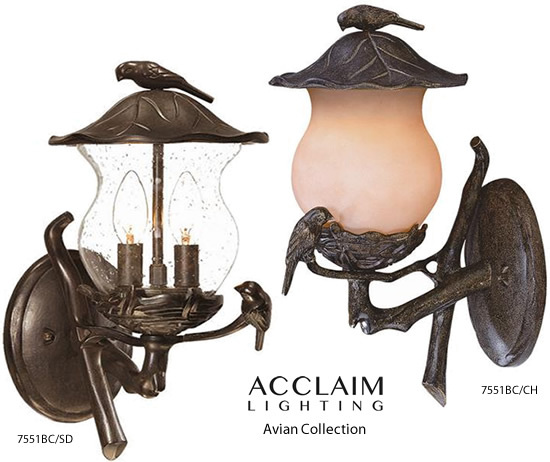 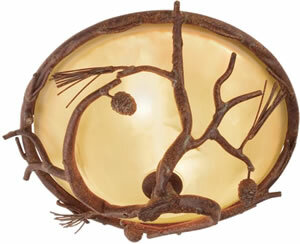 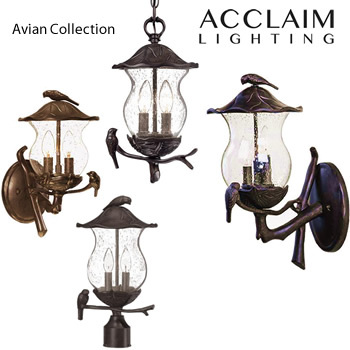 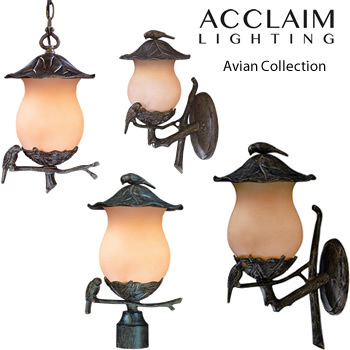 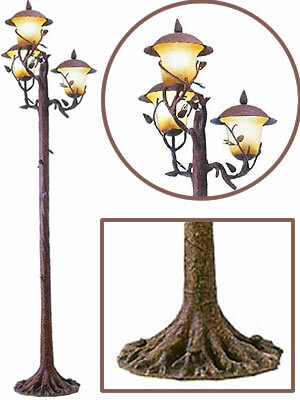 Height: 16.5" x Width: 8"
Height on Center: 11" Extension: 10.5"
Acclaim Lighting Avian Outdoor Collection features natural leaves and branches with a sculpted bird: Wall Lanterns in two sizes, a hanging lantern and a post light in Black Coral finish with Champagne or Clear Seeded glass. 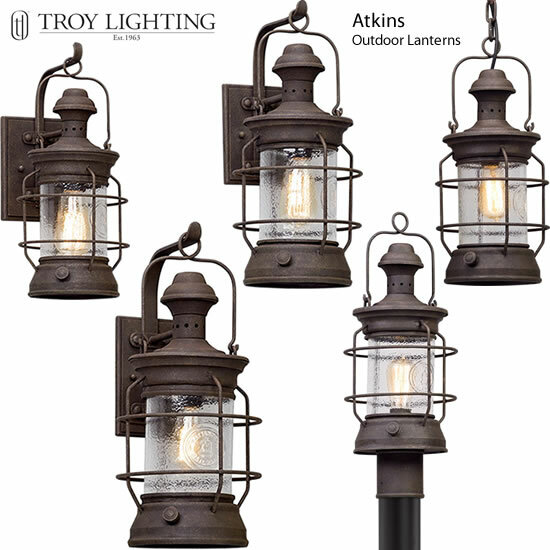 Made of Cast Aluminum, so they won't rust. 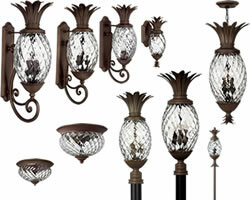 Uses Candelabra based incandescent, Fluorescent or LED bulbs. 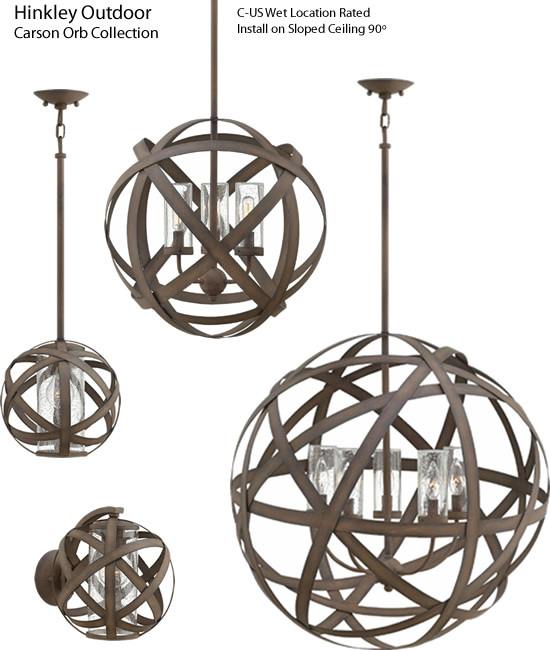 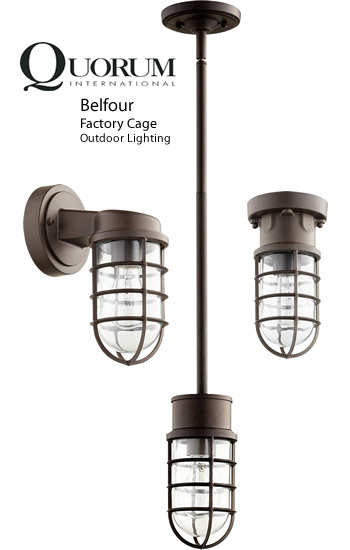 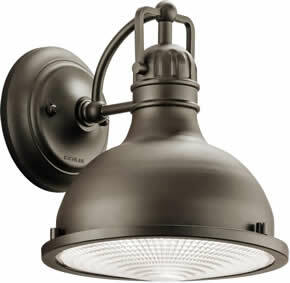 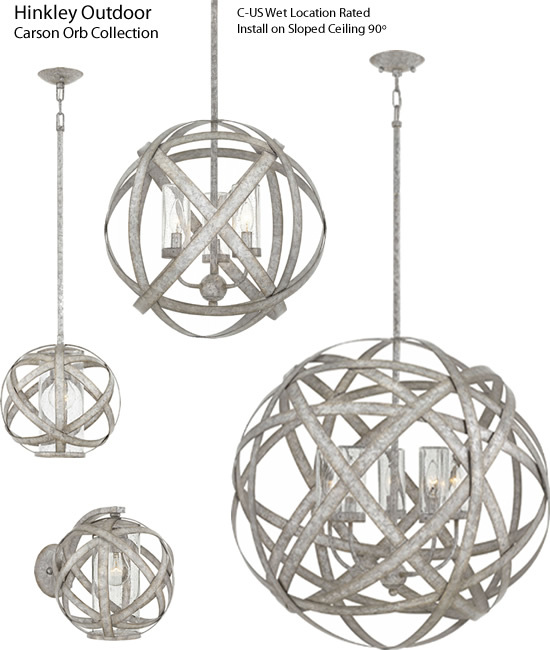 Kichler's Hatteras Bay Collection is inspired by classic industrial lighting. 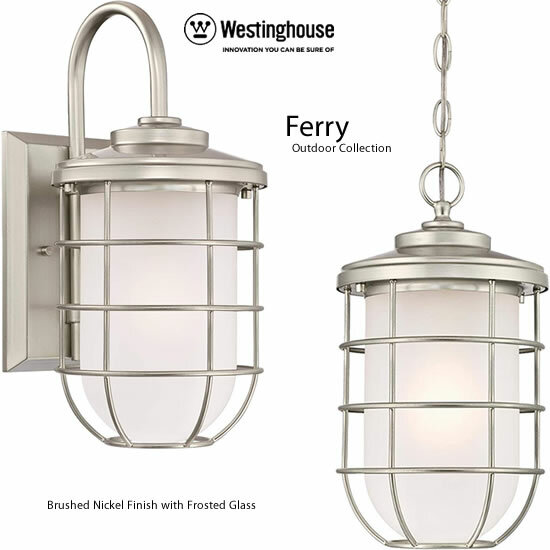 Many have clear or layered clear and white glass Fresnel lens. 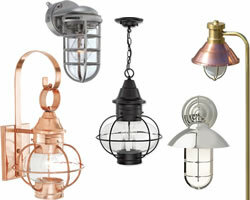 These pendants, rail lights, wall brackets and ceiling fans coordinate with rustic, urban or coastal interiors. Width 6.5" x Body Height 8"
Extension 8.75" x Height from Junction Box: 3.5"
Width 9" x Body Height 9.5"
Extension 10" x Height from Junction Box: 3.5"
Width 10.5" x Body Height 10.25"
Extension 11.75" x Height from Junction Box: 4"
Width 5" x Height 17"
Width 5" x Height 21"